Slice squash in half, lengthwise. Scoop out seeds (I use a spoon to scrape it clean) and rub each half with 1T. melted coconut oil or olive oil. Place squash, flesh-side down, on a baking sheet and transfer to the preheated oven. Bake 35-45 minutes, until tender; baking time will vary with the size of your squash. Remove from oven and use a fork to scrape the "noodles" from the squash skin. Use a spoon to scoop your "noodles" out of the squash skin. While the spaghetti squash is roasting, heat a large skillet over medium-high heat. Add bacon and cook until crisp, about 10 minutes. Transfer the cooked bacon to plate, leaving the fat in the skillet. Add onion, garlic, salt, black pepper, and crushed red pepper. Cook and stir until onions are softened, about 4 -5 minutes. Add white wine. Stir well. Simmer for 5 minutes. Add clam juice and simmer another 10 minutes. Add chopped clams and stir. Cook until heated through, about 3 minutes. 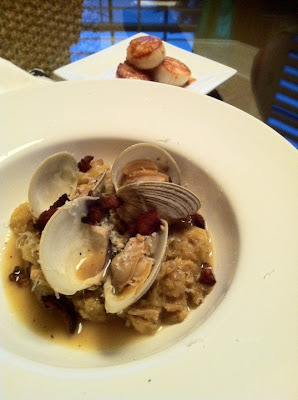 If using littleneck clams, add them to the pan, cover with a lid, and cook until open. Throw away any clams that have not opened (they are were likely dead, before cooking, and therefore should not be consumed). To serve family style, transfer the spaghetti squash to a serving bowl and pour the sauce over the top. Add the littleneck clams and reserved bacon. To serve as individual portions, add the spaghetti squash to the skillet and toss with sauce, to coat. Divide the squash mixture between bowls and garnish with littleneck clams, bacon, and parsley, if using. This was awesome! I skipped the clam juice and just used the juice from the can of clams. Definitely will be eating this again - may add some zucchini next time and lemon juice. Delicious as is, however! I've been using this recipe for a year now and thought I'd comment! My husband and I love it and we're both picky about our spaghetti squash. This year I even grew the squash for it, so I'm looking forward to making it again.